An oddity from the early days of the Compact Disc is a collection U.S. issues on the A&M label that bear an unusual Compact Disc format logo. The origin of this logo is unknown, but since it is only seen on A&M titles, it could have been proposed and then used by A&M before a standard logo was adopted. 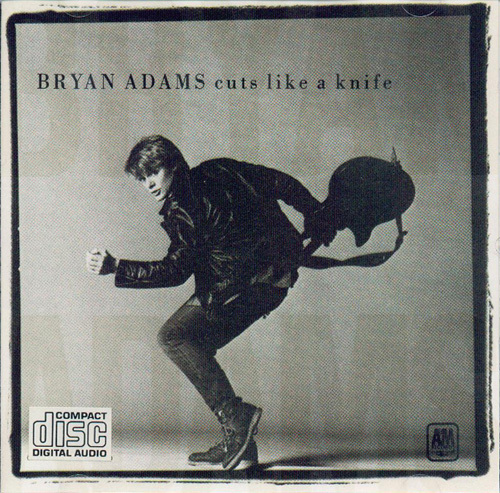 The unusual logo is shown below on a Japanese Denon pressing of Bryan Adams Cuts Like a Knife. An early Japanese Denon pressing of Bryan Adams Cuts Like a Knife (A&M catalog number CD-4919). Note the unusual Compact Disc format logo at 7 o’clock. The above Bryan Adams disc is the only actual disc I have located bearing this format logo. Otherwise, the logo is found printed on the cover of accompanying booklets. However, the logo is covered with a sticker bearing the standard format logo. This suggests that the booklets were printed before a standard was adopted but went to market after the standard was adopted. Rather than discard the booklets, A&M simply modified them with a sticker. I have found Japanese pressings of Bryan Adams Cuts Like a Knife, Joe Jackson Night and Day, Quincy Jones The Dude, and The Police Synchronicity with booklets bearing the unusual logo on the cover and a sticker covering it. If one holds the booklet cover up to light, the unusual logo can be seen behind the sticker. Generally, Japanese Matsushita pressings are found with the booklets described above. In the case of Night and Day and The Dude, the Matsushita pressings have red text as opposed to the black text commonly found on early A&M CDs. 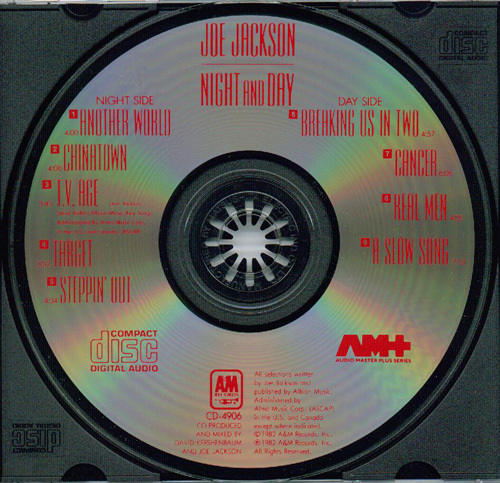 Shown below are pictures of two covers bearing the standard Compact Disc format logo stickers and a Japanese Matsushita pressing of Joe Jackson Night and Day. The booklet from an early Japanese Matsushita pressing of Bryan Adams Cuts Like a Knife (A&M catalog number CD-4919). The Compact Disc format logo in the bottom left corner is printed on a white sticker affixed to the cover. Underneath the sticker and printed on the cover is the unusual logo shown on the Cuts Like a Knife disc above. Another distinguishing feature of this cover is “BRYAN ADAMS” printed in the background. Later U.S. pressings and some early Japanese pressings are found without this background “branding”. 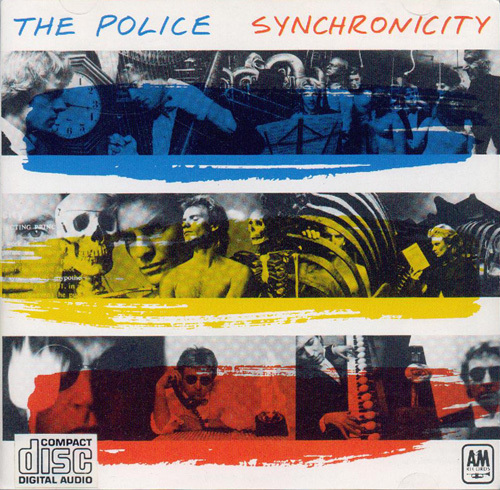 The booklet from select Japanese pressings of The Police Synchronicity (A&M catalog number CD-3735). 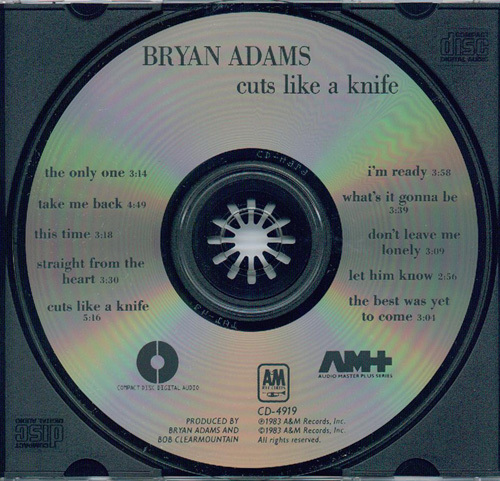 As with the Bryan Adams cover above, the Compact Disc format logo in the bottom left corner is printed on a white sticker affixed to the cover. Underneath the sticker and printed on the cover is the unusual logo shown on the Cuts Like a Knife disc above. This booklet is commonly found with a Japanese Mathsushita pressing, but I have also found it with a Japanese CBS/Sony pressing. An early Japanese Matsushita pressing of Joe Jackson Night and Day (A&M catalog number CD-4906). The booklet accompanying this rare pressing has a Compact Disc format logo sticker like the Bryan Adams and Police booklets shown above. The red text on this disc is a distinguishing feature of this pressing. Japanese CBS/Sony and Denon pressings, a West German Polygram pressing, and later U.S. pressings of Night and Day all bear black text.